So, you are on the moon and need to build a new structure. As one of the first lucky colonists there, what are you going to use? Lunarcrete of course. Lunarcrete is a mixture similar to concrete that could be created using the loose layer of dust and rock covering the surface of the moon. Creating structures from lunarcrete will be one of the keys to cutting colonization costs and increasing self sufficiency of colonies. Terrestrial experiments show that creating a concrete-like substance from lunar rock is possible, but is it practical? Transporting a kilogram of payload into space costs between $50-$100,000, making the typical 80 pound bag of $6 concrete mix from Home Depot cost two million dollars by the time it leaves the planet. In order to provide lunar colonists with building materials, making use of available resources is necessary to keep costs from becoming prohibitive and open up possibilities for long-term colonization. Regolith is the term used for the loose mix of dust, small rocks, and soil covering the surface of the moon. Making use of lunar regolith would provide a self-sufficient supply of building materials for generations of lunar colonists. Most theories suggest using regolith as an aggregate to create a form of lunar concrete. Concrete, in addition to an aggregate, needs some form of a binder; with water and a cement binder used to create concrete on Earth. When it comes to lunar colonization, however, water immediately leaves the equation. One academic lab got a chance to experiment with 40 grams of lunar regolith in order to create lunarcrete and observe its properties in the 1988 paper, Physical Properties of Concrete made with Apollo 16 Lunar Soil Sample. The Apollo 16 mission aimed to characterize lunar soil, with a desire to determine how porous the top layer of soil is by plunging rods into the surface of the moon. The Apollo 16 crew brought a large number of soil samples back to Earth, including a large fragment from a 4 foot by 5 foot boulder. This attempt to make concrete from actual lunar regolith no doubt goes down as one the most nerve-wracking moments in graduate student history - a mere sneeze would cast precious grains of extraterrestrial regolith into the wind. The researchers created a 1 inch cube, a 0.5 inch cube, and a series of structural beams using steam and high temperatures and tested their physical properties. 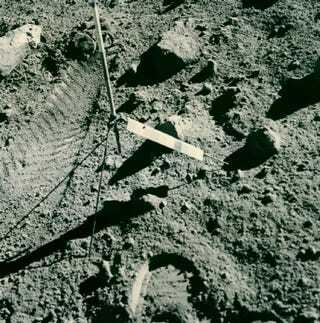 The group concluded that lunar regolith would be an excellent aggregate for use in the the creation of concrete; concrete of high enough quality to be used to construct buildings on the moon. Labs unable to acquire a lunar soil sample for experiments use high moisture-content coal ash or a number of lunar regolith simulants like JSC-1 or MLS-1. Experiments with JSC-1 have successfully created a form of lunarcrete using sulfur instead of water, allowing water to be spent ensuring the survival of colonists. The first lunar shelters will likely be a low weight, high strength plastic and transported along with initial groups of colonists, but a 1st/2nd generation building material will be of use to colonizers. In addition to going the route of traditional concrete creation, at least two other methods using lunar regolith to create structures are available. Microwaving loose regolith would create fused, molded blocks without the need for a binding material. These blocks would not be useful for creation of air-tight housing, but could provide protection for launch sites or areas with explosive activity. Image a pile of LEGO-like blocks made out of lunar regolith, ready to be made into any form imaginable. It sounds surreal, but I'd gladly eat at a table made of of LEGO moon blocks. Another method of block creation would call for melting regolith in a furnace, and casting it into molds. The resulting blocks would be extremely brittle. The brittleness would pose a problem in an oxygen void atmosphere, as shard produced in the manipulation or cutting of these blocks would pose a lethal threat. The melting method will also be useful for a another purpose - heating lunar regolith to temperatures above 600 degrees Celsius releases oxygen, oxygen which could be diverted for use by colonists. Making Earth-like concrete will not be an option until sufficient oxygen or water supplies become available on the moon. In the meantime, lunarcrete could be supplemented with light-weight, but high strength materials like Kevlar transported as payload from Earth. Steel is often used for this purpose on Earth, but transporting steel to the moon for this use would be extremely expensive. 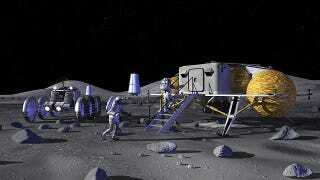 Placing permanent bases on the moon for mining or Helium-3 gathering operations will likely happen in our lifetime. Cost and safety will vie for first priority for the first groups of colonists, regardless of the nation or private corporation backing the group. Creating lunarcrete is a step in the right directly to the self sufficiency of lunar colonists, and no doubt a part of long-term colonization plans on the moon and on Mars. Could Helium-3 really solve Earth&apos;s energy problems? The top image is a piece of concept art by NASA. Images courtesy of NASA, John Young/NASA, and the image of the Apollo 16 fragment is via NASA Images.